2. Why Rust and WebAssembly? 5.8. Which Crates Will Work Off-the-Shelf with WebAssembly? This is unpublished documentation of working with Rust and WebAssembly, the published documentation is available on the main Rust and WebAssembly documentation site . Features documented here may not be available in released versions of tooling for Rust and WebAssembly. This section will show you how to build and run your first Rust and WebAssembly program: a Web page that alerts "Hello, World!" Make sure you have followed the setup instructions before beginning. The project template comes pre-configured with sane defaults, so you can quickly build, integrate, and package your code for the Web. This should prompt you for the new project's name. We will use "wasm-game-of-life". Let's take a look at a couple of these files in detail. The Cargo.toml file specifies dependencies and metadata for cargo, Rust's package manager and build tool. This one comes pre-configured with a wasm-bindgen dependency, a few optional dependencies we will dig into later, and the crate-type properly initialized for generating .wasm libraries. The src/utils.rs module provides common utilities to make working with Rust compiled to WebAssembly easier. We will take a look at some of these utilities in more detail later in the tutorial, such as when we look at debugging our wasm code, but we can ignore this file for now. The README.md file is copied from the main project, but the others are completely new. The .wasm file is the WebAssembly binary that is generated by the Rust compiler from our Rust sources. It contains the compiled-to-wasm versions of all of our Rust functions and data. For example, it has an exported "greet" function. Once again, let's take a closer look at some of these files. This package.json comes pre-configured with webpack and webpack-dev-server dependencies, as well as a dependency on hello-wasm-pack, which is a version of the initial wasm-pack-template package that has been published to npm. This file configures webpack and its local development server. It comes pre-configured, and you shouldn't have to tweak this at all to get webpack and its local development server working. This is the root HTML file for the Web page. It doesn't do much other than load bootstrap.js, which is a very thin wrapper around index.js. Note that webpack is not required for working with Rust and WebAssembly, it is just the bundler and development server we've chosen for convenience here. Parcel and Rollup should also support importing WebAssembly as ECMAScript modules. Rather than use the hello-wasm-pack package from npm, we want to use our local wasm-game-of-life package instead. This will allow us to incrementally develop our Game of Life program. 🐞 Did you get EACCESS or permissions errors when running npm link? How to Prevent Permissions Errors with npm. Our Web page is now ready to be served locally! 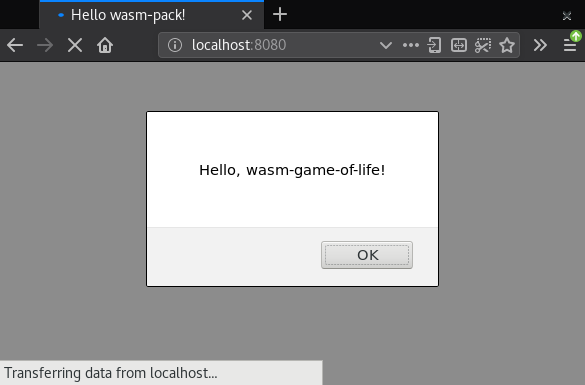 Anytime you make changes and want them reflected on http://localhost:8080/, just re-run the wasm-pack build command within the wasm-game-of-life directory. Modify the greet function in wasm-game-of-life/src/lib.rs to take a name: &str parameter that customizes the alerted message, and pass your name to the greet function from inside wasm-game-of-life/www/index.js. Rebuild the .wasm binary with wasm-pack build, then refresh http://localhost:8080/ in your Web browser and you should see a customized greeting!